Dealing with a faulty or unreliable garage door can be frustrating. Nobody likes to get stuck outside in the rain, especially with Florida’s intense seasons. If you have problems with your system, it’s essential to seek out professional garage door services for both financial and safety reasons. If you’re in need of garage door repairs in Stuart, Port St. Lucie, or the surrounding areas, our team is here and ready to diagnose the problem. Guaranteed Garage Repair is proud to serve as your Top Rated Local® garage door company across Florida, striving to deliver results that are Better Than Best. We have the experience and equipment needed to provide effective and affordable solutions for every home and business. If you are dealing with a garage door that won’t close, the photo eyes may be to blame. Today, we’ll highlight what these devices are, and why they can cause headaches for many homeowners. Until the 1990s, there were no regulations mandating automatic reverse systems for residential overhead doors. Humans, pets, and property were at continual risk of being crushed by lowering garage doors, which are heavy and cumbersome. In order to prevent the dangers of roll-up door operations, regulations were put in place to require photo eyes on every system. Also referred to as photocell safety beams, these photoelectric eyes serve as an invisible radar for any obstructions in the door’s closing path. One device is placed on each end of the frame, slightly elevated off of the floor. The first photo eye emits a beam that serves to reflect off of the second eye and return. If the path is clear, the garage door opener will be allowed to operate. Any disturbances in the beam’s path will signal the system to reverse. Combining this photoelectric system with a mechanical reversal sensor helps to ensure that your door does not inflict any serious harm on your property or loved ones. If the sensors affixed to your overhead door system are not aligned and functioning properly, problems can result. In many cases, the issue stems from one of the two photo eyes being bumped out of alignment. Falling tools, leaning bicycles, and errant soccer balls can all easily bend the arm holding the sensor or reflector. Inspect your system and look for any problems. Normally, the solution comes from correcting the position of the two photo eyes. Completing this check will resolve a majority of the problems concerning your garage door’s reversal system. If an alignment does not resolve the problem, more serious issues may be to blame. Faulty wiring, motor issues, and other component problems can all lead to failures in closing your garage door. In these situations, we recommend seeking out the help of a local garage door company — your safety is worth it! Do Not Have A Photoelectric Sensor? Older overhead door systems more often relied on mechanical reversal systems to increase safety, which consists of a sensor that reverses any closing operation once an object has been hit by the door. Mechanical systems were useful in preventing crushing injuries throughout the 1990s, but this system was only reactive, reversing operations after coming into contact with an individual or object. Photo eyes are useful in detecting any obstructions before closing the door and are therefore a preferred safety mechanism. 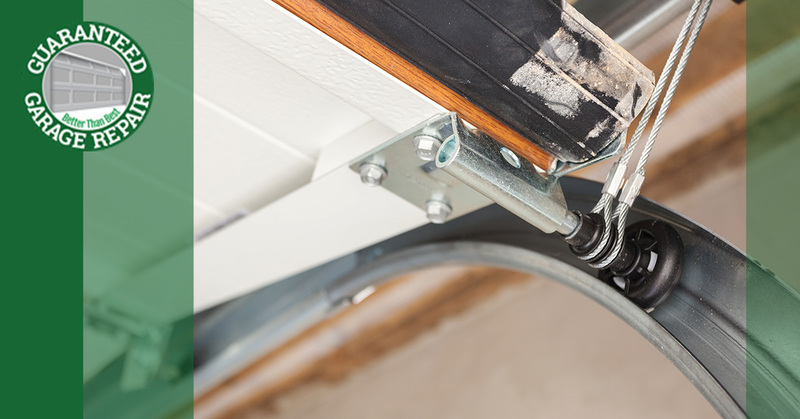 If your garage door currently does not have a photoelectric reversal system, it’s important to know that these older versions are not compatible with modern components. In any case, our garage door company can provide a complete inspection to ensure that your home is outfitted for safe, reliable results. Guaranteed Garage Repair is here to deliver guaranteed results, plain and simple. Our professional team has worked over the years to perfect our garage door services, and we’re confident that we will leave you with peace of mind for the future. Florida is home to a wide range of weather patterns, including hurricanes. In order to achieve the most peace of mind, homeowners across the Atlantic coastline rely on our garage door company. We proudly provide our garage door repairs in Port St. Lucie, Stuart, Jupiter, Fort Pierce, Sebastian, Vero Beach, Jensen Beach, Palm Beach Gardens, West Palm Beach, and Hobe Sound. Our services are tailored to provide the best result for each unique application, and our team can be reached 24/7 in case of an emergency. Guaranteed Garage Repair provides outcomes that are guaranteed, and our services are tailored to be Better Than Best. If you’re dealing with garage door problems, it may help to reach out to a professional for an inspection. Our team is here and ready to guarantee your satisfaction with all of our garage door services. Contact us today to learn about our unbeatable warranties and to schedule your inspection! ©2018 Guaranteed Garage Repair - All rights reserved.